Does it matter if love doesn’t know your age? 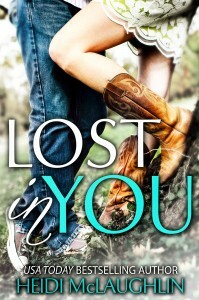 Lost in you is a story about falling in love and the struggles, which also come along, when it happens and the timing just isn’t right. Even though being a pop star has given Hadley anything money can buy what she wants most is true love. Someone to share her life with, someone who sees past her fame and simply loves, someone for her to love in return. Ryan has been sheltered his whole life. He lives each day one at a time counting them down till the one where he’ll turn 18 and can leave it all behind. Falling in love never entered his mind so when it happens he doesn’t understand the rush of emotions he experiences nor does he have the confidence to navigate around his inexperience with girls. I found myself frustrated and torn with this story, especially with the characters and how they dealt not only with each other but their lives. For me the first part of the book was excellent. I believed that they loved each other enough to overcome whatever obstacles life threw at them, even though I knew eventually something would come to try and tear them apart. I enjoyed watching that curveball be thrown at their relationship and I loved watching each character deal with the consequences. However, I felt like Heidi really rushed the last part of the story and even though Hadley and Ryan get their HEA I was left disappointed. As a reader I would like to have seen more of their individual growth as opposed to just being told in a very brief synopsis. I think maybe because I didn’t get to experience it I didn’t really find myself happy for them. I would have also like to of seen more of their story after they re-united. Perhaps with an epilogue or a chapter of reflection from each character. Overall the ending was rushed and after watching both Hadley and Ryan struggle for so long when they finally did get back together it felt as though something was missing. All of these things aside Heidi is an excellent writer and I had no problem loosing myself in the book. I always enjoy it when authors allow readers to be able to see inside each character’s mind.